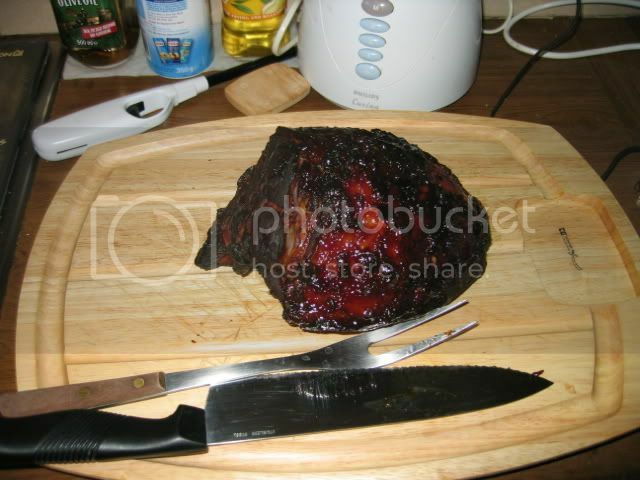 From my How to Eat Project, gammon (i.e. raw ham) was one ingredient that I couldn't find. When I made the ham in coke and the ham in cider, I substituted Vietnamese pickled pork. It worked well in the first instance, and not so well in the second. So when I came to London, trying out some real gammon was on the top of my foodie to-do list. Here is the beautiful hunk of gammon that we got at Borough Market. Once the ham is boiled, you remove it from the stock, and can either proceed straight away with the glazing, or leave it to cool in the fridge overnight, and glaze the next day. We were busy, so we did the overnight thing. 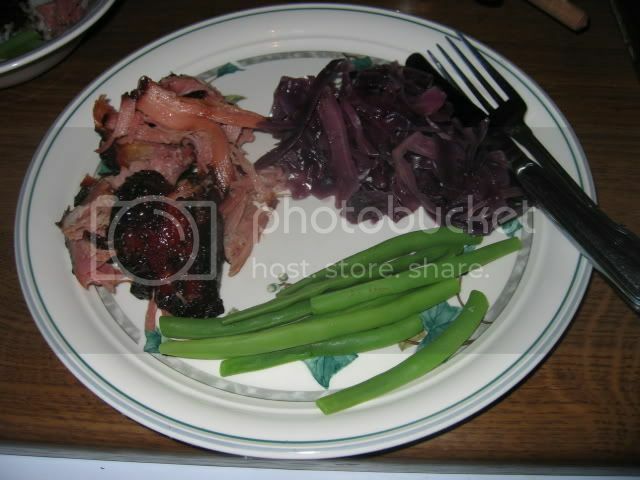 One of the benefits of boiling the ham in advance is that you can cook red cabbage (mmm... I love red cabbage!) in the stock. For this, you just shred a head of red cabbage, and simmer it in the stock for about an hour. While it was simmering, we glazed the ham by stripping off the rind and brushing it with a mixture of cherry jam, red wine vinegar and sweet paprika. Then you need to cook it for 40 minutes at 180C. 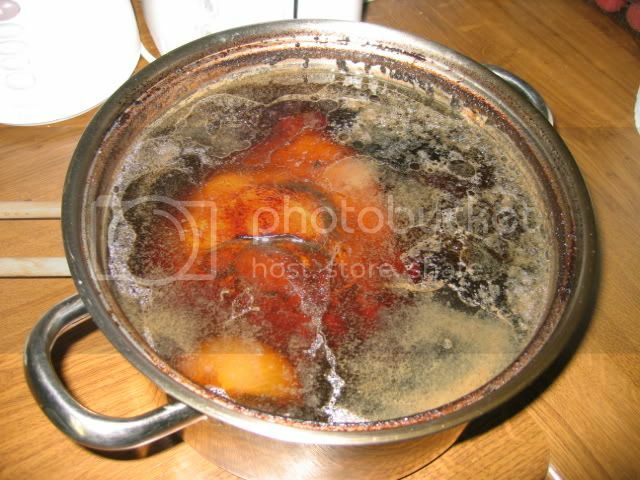 (If you're proceeding straight after the boiling stage, without letting it cool overnight, then you cook it at a much higher heat for a shorter time). Cooked - Check it out!! Drooooool! While the ham was resting, we boiled some green beans and finished off the cabbage. Nigella says to be careful not to let too much liquid escape during the simmering process, but we cooked it for ages, didn't cover the pot, and my cabbage remained very very wet. Not to worry though, it was a simple matter to strain off the excess liquid. The ham in cherry coke is amazing! And this is coming from a girl who hates cherry coke and Dr Pepper with a passion (ew... tastes like medicine!). It doesn't taste overtly cherry-like, but rather, has a subtle cherry aroma, which enhances the sweet and burnished glaze. Similarly, on the page, the red cabbage sounds like it would taste absolutely munting, but it was actually delicious. It was slightly sweet, but not sickeningly so. It went with the ham incredibly well. Looks wonderful. I've wanted to try the ham in coke for a while, but i'm too chicken...don't know why. make sure you try some jamon from jabugo in spain! It looks ok, but a bit burned. I usually foil the ends of my ham to stop the charring. 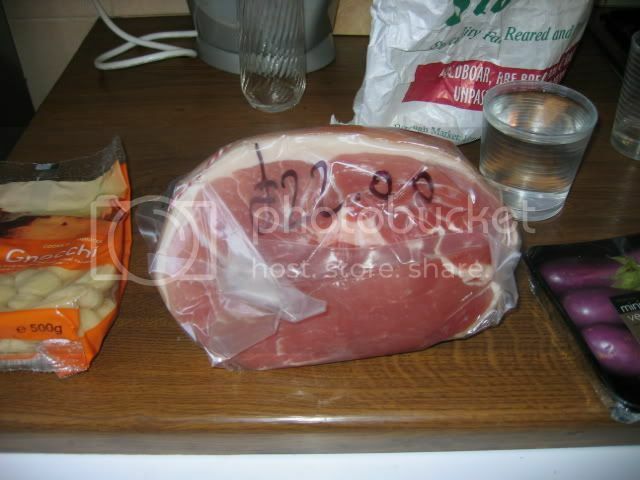 £22 is incredibly dear for a piece of ham, supermarkets are doing the same amount for about £12.